ECIPE > European Union > EU Single Market > Who Reforms for Higher Productivity? With weak European growth performance over a longer period of time, it is time to push reforms raising the rate of productivity growth. The EU’s best strategy for it is to cut restrictions for single market trade in the services sector. There are still major restrictions in place and services regulations differ substantially between EU countries. Reforming regulatory barriers that create excessive costs for production and trade in services is therefore key to improving productivity growth. Although some reform has taken place over the last year, changes in these regulatory barriers however have been marginal and much more needs to be done in order to create significant economic gains. As a result, there is a strong economic case for countries to reduce excessive regulation, find as much harmonisation in regulation that is possible, and instruct regulators to cooperate across countries to synchronize their regulatory systems in services. With sluggish growth performance in the EU over the last years, it is increasingly important to make reforms that lift economic growth. While there are various sources of growth, one outstanding factor determining growth rates is how productively an economy uses economic resources such as labour and capital, or what we in normal speak would call productivity. Productivity measures how much value-added can be extracted from efficiently using economic resources and, consequently, is one of the most important sources of growth, especially in developed economies like Europe. A chief task for a growth programme for Europe is therefore to raise the weak rates of productivity growth that it has experienced over the past two decades. Research has shown that what actually explains the divergent performance of economic growth in European countries is the rate of productivity in the services sector. Services dominate in most (if not all) European economies. On average the EU holds a level of value added in services that comprises around 73 percent of its Gross Domestic Product (GDP). Per country this level ranges from 87 percent in Luxembourg and 80 percent in Greece to 59 percent in the Czech Republic. Although the importance of the services sector expands with the level of development, this, however, is not necessarily the case. For instance, Germany holds a percentage in services of 68 percent, well below the European average, which may be due to its advanced manufacturing base in which many services are integrated. Greece and Portugal ranks among the top countries with high services value-added which is mainly due to their tourism sector. The share of domestic services value-added of a country is important because it helps to explain the success of being competitive abroad. In other words, a greater “services base” of a country indicates how successful a country is in terms of trade in services. For instance, smaller countries are usually good in exporting services, because their relative share of services value-added is also bigger. Indeed, within Europe, a larger share of value-added in services is associated with greater levels of trade in services as part of the domestic economy. This, in turn, is associated with greater levels of value-added growth across European countries. In 2014, Europe’s growth rate averaged a 1.44 percent. Countries above this average had higher services trade while countries below this average had a lower level of services trade. Despite these relationships, the way in which services are supplied for businesses and consumers is not always efficient and therefore policy reforms could improve the conditions for the services sectors to make a greater contribution to productivity growth. As a matter of fact, many of these services are still restricted in the sense that burdensome regulations for firms impede the useful employment of labour, skills and knowledge in services within and across countries. For instance, Europe still has relatively high regulatory restrictions on accounting, legal services, and air transport services. Most services are labour intense and therefore require an easy cross-border flow of skills (either low or high-skilled people) to have them produced, delivered or traded between countries. Regulations often prevent the efficient production of skills and hence the easy flow of services across borders, inhibiting an allocation of production to where they are produced best. 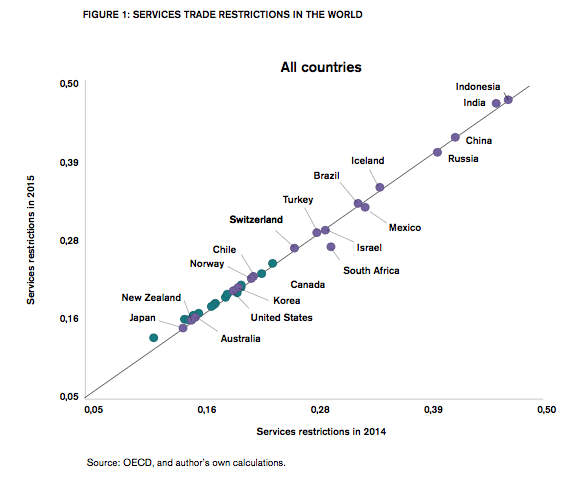 Which countries are therefore most restricted in services? And, more importantly, which countries have been willing to undertake reform over the last year with an aim to deliver higher productivity? 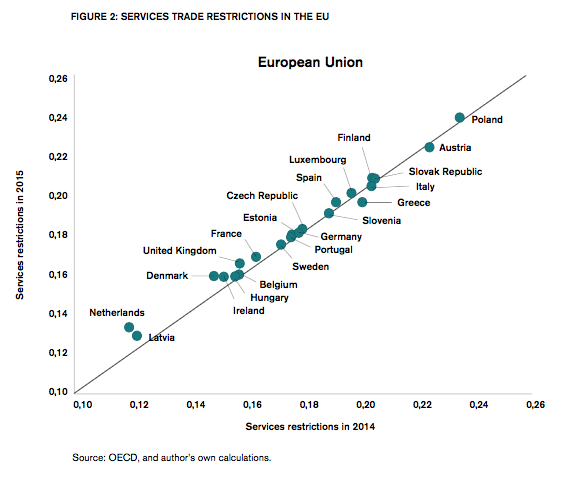 Figure 1 below plots the OECD index of services trade restrictions for the years 2014 and 2015, which cover both trade and domestic regulatory restrictions. The horizontal axis shows level of regulations in 2014 whilst the vertical axis shows the level regulations in 2015. Figure 1 leads to various conclusions. First, worldwide, emerging economies such as India, China, Indonesia, and to a lesser extent Russia and Brazil are still the most restricted countries in the world with relatively high regulations in services in both 2014 and 2015. As part of a second league of countries, there are countries such as Brazil, Israel, Mexico and Iceland, which still have some major restrictions in place. Turkey also falls into that group, but as an emerging economy it shows a level of restrictions that is much less than some of its comparators. Finally, there are European countries plotted in blue, which, on the whole, show lower levels of burdensome restrictions. In the same group of those European countries are also Norway, Japan, New Zealand and Canada and the US, which share a similar level of restrictions as the most European economies. Nonetheless, there are large differences between European countries. Figure 2 replicates Figure 1 but zooms in on European Union countries. The first message from this figure is that Poland and Austria show the highest services trade restrictions in both 2014 and 2015. Other European countries such as Greece, Finland, Italy and the Slovak Republic also still have some major services restrictions in place and therefore form a second-tier group. On the lower end of this group one can find Denmark and Ireland. On the other side of the spectrum there are the Netherlands and Luxembourg, both of which have very open services markets. Hence, for countries to obtain the level of restriction of this latter group, some work still needs to be done to “free” services regulations from being tradable. Which countries have been able to move away from restrictions in services and, therefore, committing themselves to deliver on productivity and growth? It is possible to analyse this “move” towards greater services reform in favour of productivity by analysing the two figures from both axes presented. If a country is placed below the straight diagonal line which runs from the lower left corner up to the upper-right corner, it means that the level of reform in 2015 is lower than in 2014, which points to positive reform of the country’s services market. On the other hand, a country placed above the diagonal line moves into the opposite direction of higher levels of regulations, which points to increased regulations in 2015 compared to 2014. In the EU not much has happened between the two years. Nonetheless, the main reformers, although modestly, are Greece and Austria which have lowered their services restrictions. Greece is involved in structural reforms in many sectors, including the lowering of market-entry barriers, whilst Austria has liberalized some professional services and computer services by improving regulatory transparency – for instance visa-processing times, cost of procedures to set-up a company and whether there is a public-comment procedure open to interested persons, including foreign suppliers. Italy is another country that has reformed modestly in some of the professional business services such as architectural services and legal services, also mainly in the area of regulatory transparency. On the other hand, the Netherlands, Denmark, Latvia and the UK have moved away from the diagonal line in the opposite direction, which means that they have increased their restrictions in services. This is in great part due to the fact that these countries have tightened their restrictions regarding the movement of people in some of the professional services (Latvia has also increased some restrictions in regulatory transparency). Overall, some of the countries which have been more restricted have slightly liberalized, whilst some of the countries which were already more liberal have slightly increased their regulatory restrictions. In this regard, perhaps the EU is slowly moving to an average point in which some regulatory convergence is taking place. There are many services regulations that objectively can only be considered unnecessary and create excessive costs for businesses, inhibiting the efficiency of production and the delivery of services for consumers. However, there is good reason for regulation in many services because they have market-failure problems that require government intervention in order to attain, for instance, country wide, noneconomic policy goals. Examples include protecting consumer from price exploitation by providing affordable services (or services coverage) in post or telecoms, or safeguard consumers from bad quality professional service providers. These interventions are managed by regulatory authorities that are split between the many different sub-sectors of the service economy. Hence, services sectors often have separate regulators such as telecom regulators, financial authorities or legal services boards. This is similar to the regulatory bodies that set and oversee standards in goods sectors. The point with regulators, however, is that since they are institutional bodies in their own right, defending a certain (noneconomic) public-policy objective, their structure influences the ease at which regulations can change. Moreover, regulatory authorities are often the frontline guard against trade in the services sector because, in contrast to trade in goods, there are no tariffs or other direct border barriers, but regulations that are placed inside a country’s jurisdiction. This institutional factor of services trade is what often makes it difficult to further reform in services sectors, or differently put, partly explains the slow pace of reform in services. Moreover, there are several examples of how services regulators hold up reform. They have a knowledge advantage and the financial and human resources to develop an expertise that others cannot acquire. While this advantage gives authorities the opportunity to further their own organisational interest, it also follows naturally from the simple fact that these regulatory institutions operate primarily to advance domestic policy goals. Their task is not to align regulatory practices with ambitions to advance trade and regulatory cooperation, and it can only be made their task if new laws instruct them to behave in a new way. However, as authorities are often participating in actual negotiations over trade and regulatory cooperation, they end up in a catch-22 like situation: regulators lead on technical negotiations with other countries to make regulations and regulatory practices more compatible across borders, but they cannot lead towards such outcomes unless they first receive new legislative instructions. As a result, conflicting interests occur when attempts are made to open up domestic services markets for foreign services providers in order to lower excessive services trade restrictions creating burdensome costs. In short, it is essential for the EU to reform its services markets and to press laggard economies to reform and get closer to the reform leaders. This is not only important for lowering the sheer overall “level” of restrictions in the EU, but also for making it easier to induce new trade across Europe. Regulations in member countries still differ, sometimes substantially, resulting in variability of regulatory restrictions that drives up costs further of using the single market because new markets cannot be reached. It is this type of new trade that has an additional strong influence on reaching new productivity gains, next to increasing volumes of existing trade due to lowering regulations. This so-called heterogeneity of regulations in member states therefore constitutes an additional negative cost factor that prevents economies from accessing potential productivity growth in EU services markets. Simply put, costs due to different regulations must be incurred by the firm every time it wants to reach a new export (or import) market. Having different levels of regulations in the EU is therefore reducing the full potential gains from reaching higher productivity levels in services. As a result, there is a strong economic case for countries to deregulate excessive regulation, find as much harmonisation in regulation that is possible, and instruct regulators to cooperate across countries to synchronize their regulatory settings, be it within the EU or between the EU and other trading partners as part of TTIP or TISA. Reforming the services markets is a long process because of political opposition or institutional resistance to reform. While there are different approaches to how countries can lower regulatory restrictions in services in the future, there is a difference between, on the one hand, trade negotiations aiming to gradually reduce some aspects of restrictions to trade in services and, on the other hand, the EU ambition to build a single market for services. Creating a market is a far more ambitious task – and one that naturally will have far stronger outcomes. Yet it sets far more demanding conditions on governments that regulations are distinct, effective, balanced, and in the public interest. It requires far more trust in regulations, regulatory authorities, and the pursuit of good regulatory outcomes – and, at least so far, such trust has been missing in Europe. While it is important to address potential negative effects from deregulation and harmonisation, it is critical for the growth potential of Europe’s economy that there are much bigger changes in the default setting of regulatory heterogeneity. For the single market to deliver necessary economic gains, there has first to be a single market.